One of Lee Middleton's Newborn Nursery Babies. This delightful munchkin can be either a boy or a girl and issurprisingly lifelike with a light skin tone, brown hair, and blue eyes. The content expression shows just how much baby is loved and is being well takencare of. 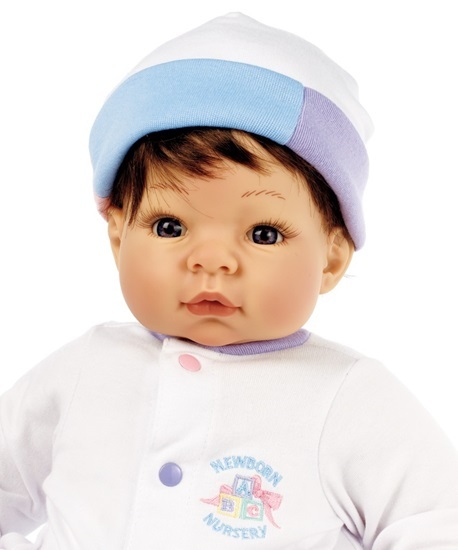 Newborn Nursery babies are designed to look and feel like real babies,and at 19 inches long and 3.5 lbs, this baby is realistically newborn sized. Little Munchkin comes to youwearing a white one-piece romper with pink, lavender, and blue accents and theNewborn Nursery Logo on the front. Amatching cap and an identification bracelet are also included. The newborn babies have vinyl heads, handsand feet and cloth bodies, which makes them so charmingly huggable. 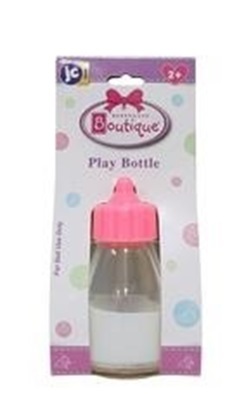 Tip the bottle, and the liquid magically disappears, supplying hours of fun for your little one..
From the 2011 Fall Collection of Adora Dolls, this little cutie is dressed for a serious work-out!